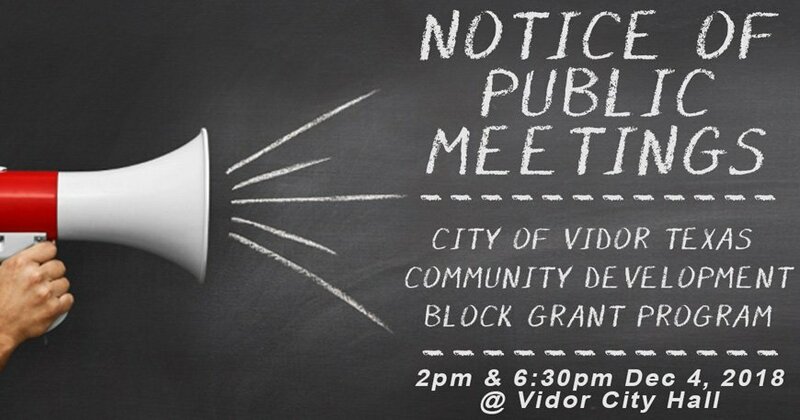 The City of Vidor will hold public meetings at 2:00 p.m. and 6:30 p.m. on December 4, 2018, at the Vidor City Hall located at 1395 North Main Street, Vidor, Texas regarding the submission of an application to the Texas General Land Office for a Community Development Block Grant-Disaster Recovery Program (CDBG-DR) grant. The purpose of this meeting is to inform citizens of the CDBG-DR funding available to the City for housing assistance and acquisition/buyout and allow citizens an opportunity to provide comments for the development of the City's proposed plan for implementing the CDBG-DR program. The City encourages citizens to participate in the development of this CDBG-DR application and to make their views known at these meetings. 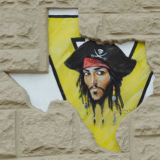 Citizens unable to attend this meeting may submit their views and proposals to Mike Kunst, City Manager, at 1395 North Main Street, Vidor, Texas 77662. Persons with disabilities that wish to attend this meeting should contact the City Manager at (409) 769-5473 to arrange for assistance. Individuals who require auxiliary aids or services for this meeting should contact the City Manager at least two (2) days before the meeting so that appropriate arrangements can be made.